Scientists have discovered that water is being released from the moon during meteor showers. When a speck of comet debris strikes the moon it vaporizes on impact, creating a shock wave in the lunar soil. For a sufficiently large impactor, this shock wave can breach the soil's dry upper layer and release water molecules from the hydrated layer below. The LADEE spacecraft detects these water molecules as they enter the tenuous lunar atmosphere. This discovery provides a potential resource for future exploration, and it improves our understanding the moon's geologic past and its continued evolution. Artist’s concept of the LADEE spacecraft (left) detecting water vapor from meteoroid impacts on the Moon (right). “The Moon doesn’t have significant amounts of H2O or OH in its atmosphere most of the time,” said Richard Elphic, the LADEE project scientist at NASA’s Ames Research Center in California’s Silicon Valley. “But when the Moon passed through one of these meteoroid streams, enough vapor was ejected for us to detect it. And then, when the event was over, the H2O or OH went away.”Lunar scientists often use the term “water” to refer to both H2O and OH. Figuring out how much H2O and how much OH are present is something future Moon missions might address. 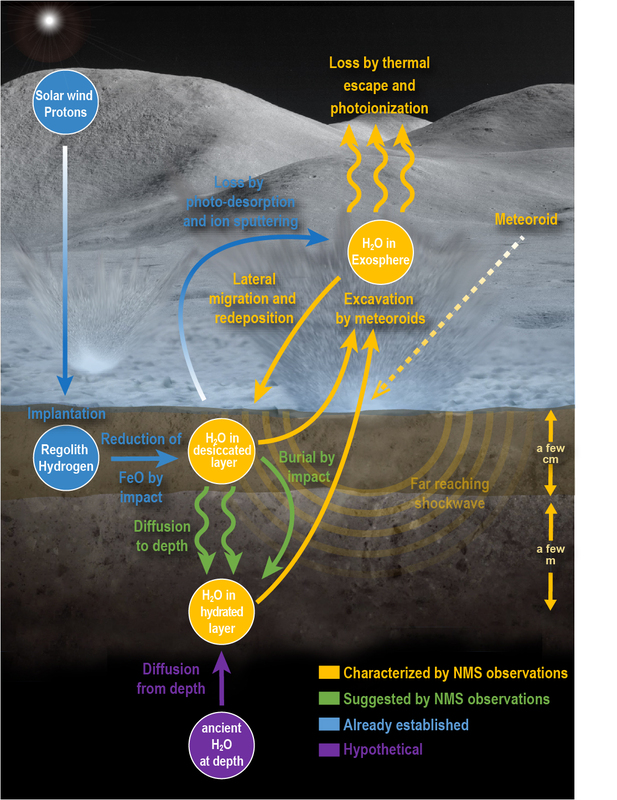 This infographic shows the lunar water cycle based on the new observations from the Neutral Mass Spectrometer on board the LADEE spacecraft. At the lunar surface, a dry layer overlays a hydrated layer. Water is liberated by shock waves from meteoroid impacts. The liberated water either escapes to space or is redeposited elsewhere on the Moon. Some water is created by chemical reactions between the solar wind and the surface or delivered to the Moon by the meteoroids themselves. However, in order to sustain the water loss from meteoroid impacts, the hydrated layer requires replenishment from a deeper ancient water reservoir.